The latest proposed site for a new Florida Marlins baseball park has drawn praise from some and skepticism from others but no pledges of new money to fund construction. Some of Miami-Dade’s top officials are optimistic that a new downtown stadium site could plant the Florida Marlins in the heart of the city, but financing its construction remains a major hurdle. Just north of the Stephen P. Clark Center, the nine-acre site would give baseball fans easy access to existing parking lots, commuter rail and Interstate 95. It is also just blocks from two other top entertainment destinations — the American Airlines Arena and the Carnival Center for the Performing Arts. ”We really think this can work,” said County Manager George Burgess. But even as details emerged Tuesday, some county commissioners said the site is too small and they are wary of moving a juvenile courthouse planned for the same spot. Moreover, no one involved in the deal — including the team, the county and the city of Miami — committed to chip in more money to close a funding gap of $90 million or more. ”It’s premature for any of us to be talking about numbers,” said Miami Mayor Manny Diaz. The Marlins’ lease at Dolphin Stadium runs through 2010, at which point the team wants to move to a new, retractable-roof stadium. The club has not ruled out relocation, but has not pursued it since talks with San Antonio ended in May. A team spokesman declined to discuss the new site. ”We continue to look at all our options in South Florida, and this is one of them,” said P.J. Loyello, senior vice president for communications and broadcasting. County government has offered previously to spend $120 million for a new stadium and the team was willing to spend about $210 million. That was still far short of the estimated cost, projected at $420 million earlier this year and likely growing as construction costs increase. Local leaders also hope to coax the state Legislature into providing some cash; previous efforts have failed, but South Floridians are playing more powerful roles in Tallahassee next year. Other sites are still being discussed, including one near Interstate 75 in Hialeah and another just south of the Miami Arena. Both, however, require purchasing some privately held land, which would drive up the project’s overall cost. At the new downtown site, all the land is government owned — mostly by the county, with a small piece held by the city. Both Metromover and Metrorail stop at the Clark Center, connecting the site to neighborhoods from Dadeland to Hialeah. And Burgess said the ballpark would be served by the numerous parking lots, restaurants and stores that otherwise empty out when the business day ends. ”It’s an urban ballpark, which has generally been successful from Major League Baseball’s perspective,” Burgess said. The plan also would require closing a child-care center attached to the Clark Center and closing or rerouting one or two roads, Burgess said. It could impact the Downtown Charter School, which would be adjacent to the stadium. Commissioner Natacha Seijas said she would have many questions about relocating the juvenile courthouse project, especially if it were moved away from other downtown courthouses. 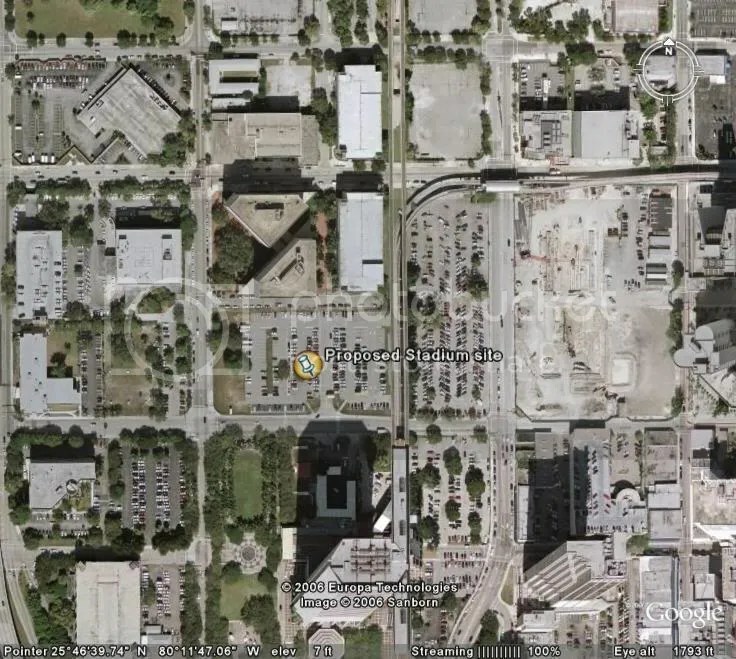 But Burgess said the county may be able to acquire land just east of the Clark Center, which would put the Children’s Courthouse closer to both rail stations and courthouses. ”This is a nonstarter if the Children’s Courthouse is impacted in any way,” Burgess said. Miami, Get Ready. The Bahamas will Rival Vegas. NASSAU — Forty-six miles off the coast of Miami is Bimini, Bahamas, a fishhook-shaped spit of sand made famous by Ernest Hemingway, who wrote Islands in the Stream there. Men play dominos at the Sand Bar and watch the occasional yacht or fishing boat that stops by. But big changes are coming to Bimini and many of the Out Islands, as well as Nassau and Grand Bahama. Buyers are snapping up brand new condos in a gated community in north Bimini, where a Conrad Hilton soon will be built. Another hotel just opened on the island and yet another condo-hotel and a fashionable boutique inn are on the way. A new hotel and casino is coming to Grand Bahama as well as a $4.9-billion, 4,500-room resort complex inspired by the Palace of Versailles. The enormous size of the resort is expected to make Atlantis on Paradise Island look small by comparison. Atlantis, meanwhile, is building an all-suite hotel — you can see the cranes and scaffolding from downtown Nassau. And new hotels are springing up on Eleuthera and Abaco. rival Las Vegas with lavish shows and glamorous hotels when it’s completed in 2010. It is a building boom the likes of which has never been seen in this island nation that usually plays second-fiddle to Florida. Even the Out Islands, the 30 islands beyond Nassau and Grand Bahama, which are known for small family-owned resorts, quaint fishing villages and empty white beaches, are getting mega-resorts. The Bahamas’s new popularity is due to lots of undeveloped, cheap (compared to the U.S.) land with bluer water and whiter sand than the U.S. east coast, and an enthusiastic government, say developers. Bimini will soon be unrecognizable to long-time visitors. The Conrad Bimini Bay Resort and Casino, the luxury brand of Hilton Hotels, will be the first luxury hotel on the small island. It is Conrad Hotels’ first venture in the Bahamas or the Caribbean. Heritage Village, which will include three hotels and a boardwalk, will transform Bimini’s largest town, Alice Town. This one is a revitalization for residents as well as tourists. It is the brainchild of longtime Bimini visitor Stanley Levine, who was responsible for the revamp of Miami Beach’s Lincoln Road, the preservation of Miami Beach’s Art Deco District, founding chairman of the Miami Beach Cultural Arts Council and secretary/trustee of the $500-million new Miami Performing Arts Center. The first phase of Heritage Village was the historic Big John’s Hotel and bar, which opened this year. It has taken the place of another landmark, The Compleat Angler, a watering hole for Hemingway and many others. The Angler burned down last year, with owner Julian Brown dying in the fire, a tragedy that came on the heels of Chalk Airline’s seaplane crash on the way to Bimini. Eleven people died. The Angler’s bartenders and band, Stevie S. and the Hypnotics are at Big John’s now. The new 300-foot seaside boardwalk, Brown’s condo-hotel on the site of the historic Brown’s Hotel, are coming soon. An upscale boutique hotel is also in the plans. The Bimini Bay development, he said, is “a gated community that could be anywhere in the U.S. That’s not what I wanted to do.” He bought and refurbished Big John’s, he said, because the community asked him to after the Angler burned down, and because he had known Big John, John Roberts, who owned it for many years. “We have all the old photographs of Hemingway, and local people are donating artifacts. We’re preserving the part of Bimini that is disappearing,” said Levine. Big John’s has seven hotel rooms, and Brown’s Hotel will have 17 one-, two-, and three-bedroom condos that will operate as a hotel. The boardwalk will connect those hotels, the End of the World Saloon (mentioned in Hemingway’s book), the Sand Bar, and eventually the new boutique hotel. The first projects to be built will be a sea wall, the boardwalk and marina, then Brown’s Hotel apartments, which will range in price from $285,000 to $700,000. Brown’s Hotel is a project that’s close to Levine — it’s where he always stayed when he came to the island. The Bimini Breeze, a fast ferry that will run between Miami and Bimini, will start service this month. Continental Airline flies from Miami and Fort Lauderdale to Bimini. Bimini Airport will be enlarged to accommodate more traffic. Discovery Land Company is building Baker’s Bay Golf & Ocean Club on the northern end of Great Guana Cay, Abaco, which will include a golf course, deep-water marina, luxury spa, a beach club, beachfront home sites and marina villas on 585 acres. Pineapple Fields, formerly the site of the exclusive Potlatch club, is a new development on a lush 80-acre property with 1,000 feet of beach front near the town of Governor’s Harbour and the airport in central Eleuthera. Twelve units of a 32-unit condo/hotel named The Club at Pineapple Field are complete and available for rent. A 32-unit condo/hotel, a spa, cottages and single family homes are planned. Another resort, Cotton Bay Estates and Villas, will have two- and three-bedroom villas, 114 estate lots, and a 26,000-square-foot clubhouse. Completion of the 73 guestrooms is scheduled for December 2007. Future projects include an 18-hole championship golf course, wellness center/spa, additional real estate and expansion of the marina. Currently part of the Audubon International Signature program, which acknowledges environmentally-friendly developments, Cotton Bay Villas will be home to a plant nursery and an on-site horticulturist dedicated to saving trees and other foliage from cleared land for replanting throughout the development. Construction has begun on French Leave Resort, which will include Savannah Hill, an upscale residential community, and a luxury resort, condos, villas, and marina and spa built on the former Club Med site. After nearly two years of standing empty, the Royal Oasis and Casino now has a buyer, according to an announcement in June by Prime Minister Perry Christie. The historic hotel, which adjoins the International Bazaar market place in Freeport, was put up for sale after damage from hurricanes Frances and Jeanne in 2004 forcing the layoff of 1,200 employees. Government officials have not yet named the buyer. But the real news on Grand Bahama is the $4.9-billion mega-resort Ginn sur Mer, a project planned by Orlando investor Robert Ginn, which will span 2,000 acres along 10 miles of oceanfront land and take 10 years to build. The inspiration for the resort was the Palace of Versailles in France.